The impressive white marble Sultan Qaboos Grand Mosque and its lone minaret at the right side illuminated by warm morning light. 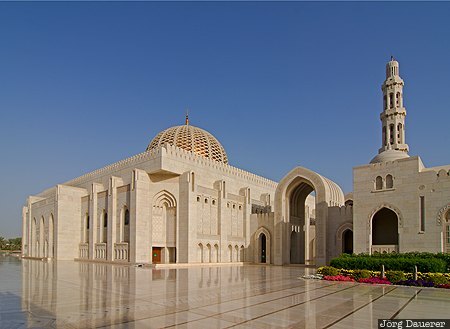 The Sultan Qaboos Grand Mosque is in the Muscat Governorate (Capital Area) of the Sultanate of Oman. This photo was taken in the morning of a sunny day in March of 2012. This photo was taken with a digital camera.